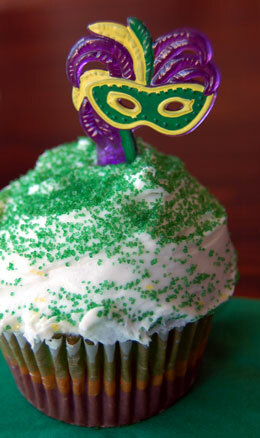 Who can resist a yummy Mardi Gras cupcake? Delicious designer cupcakes are all the rage right now. Gourmet cupcake shops abound. Creating your own cute cupcakes is not difficult or expensive. Basic cupcakes are the perfect canvas for creating your own designer cupcakes. 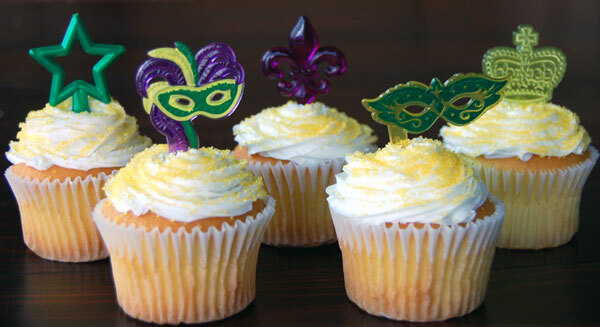 With these cute cupcake toppers, any flavor or color cupcake becomes a Mardi Gras treat. 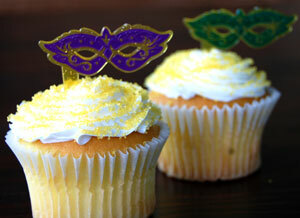 Here are some ideas to dress up your Mardi Gras cupcakes. 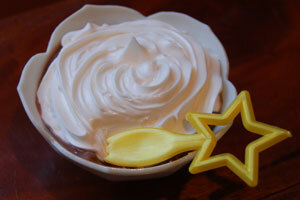 One of my favorite, these cute star toppers, also function as a spoon. Perfect for cupcakes served along with ice cream. Add this topper to any dessert you need a spoon. Great for chocolate mouse, as shown here. ﻿The star toppers come in the traditional Mardi Gras colors of purple, green and gold. Are you hungry yet? Another cupcake topper that comes in the assorted Mardi Gras colors is this Fleur de Lis cupcake pick.Translucent jewel tones of purple, green and gold really pop on plain frosted cupcakes. Our beloved fleur de lis emblem graces so many things related to New Orleans and Carnival. Why not our cupcakes? 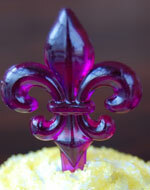 Don't limit these fleur de lis picks to cupcakes though. These picks could also be used for hor d'oeurves like a cheese tray or other sweets. These fun cat-eye shaped Mardi Gras mask picks are the perfect accompaniment for a venetian carnival event. Masquerading guests and cupcakes! Subtle gold glitter embedded in the pick adds sparkle. These picks come assorted in the two color ways shown here. 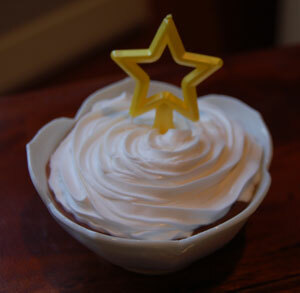 Top off your fluffy cupcakes with a regal crown topper. 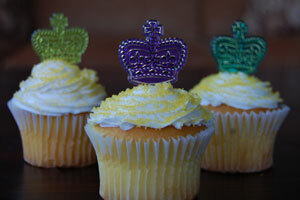 Royal Mardi Gras cupcakes fit for a king! These translucent Mardi Gras crown picks come in assorted purple, green and gold. Each is accented with metallic gold highlights. Faux plume feathers accent this Mardi Gras Mask food pick. 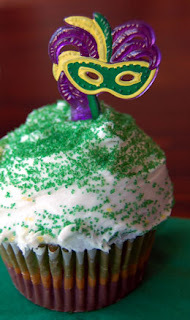 The feather mask cupcake pick shown here tops off a festive Mardi Gras striped cupcake. These striped cupcakes are easy to create with plain cake batter and food coloring. You can create any color combination you desire. The stripes are a welcome surprise when you bite into your cupcake. 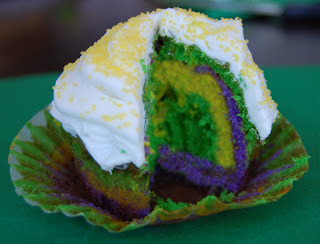 See this blog post on, Fun Striped Mardi Gras cupcakes to learn how to make these. The rest of the cupcakes shown here are basic white cake cupcakes iced with vanilla butter-cream icing. 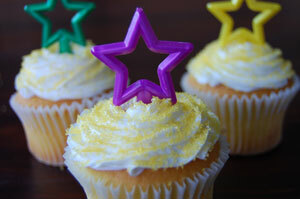 Each is topped with festive sprinkles and then a fun Mardi Gras topper accent. Last but not least, when talking about Mardi Gras desserts, we have to mention a traditional New Orleans favorite, the King Cake. 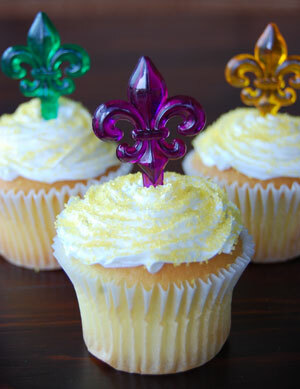 If cupcakes are your preference instead, here is a cute way to create Mardi Gras King Cake cupcakes. Click here for directions. Decorate the top of your cupcakes like a traditional king cake with a circle of alternating bands of purple, green and gold icing. Top it off with glittering sprinkles and a requisite Mardi Gras King Cake baby. 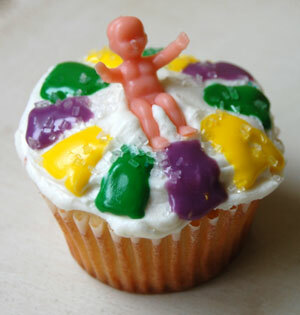 Mardi Gras King Cake cupcakes where everyone gets the baby! Then who hosts the next party? Everyone!